The last weekend in June 2014 saw SAS’s Sewage Alert Service kick into action again at Godrevy, Cornwall. Surfers Against Sewage’s pioneering water quality alert service was ‘first on the scene’ after a significant raw sewage spill originating from the sewer overflows hidden from sight up stream on the Red River. 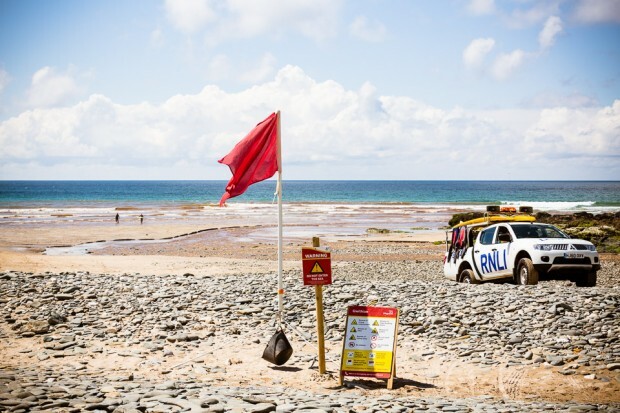 Thankfully, due to SAS’s alerts, the RNLI and National Trust were both immediately warned about the sewage pollution and could take evasive action to warn and protect surfers, swimmers and beach users. Upon notification from SAS, the RNLI red-flagged the beach and erected temporary signage warning against entering the water and the National Trust unfortunately had to postpone one of their flagship surf competitions, the Ten Board Challenge. An SAS campaigner was on site at Godrevy to give a briefing about the incident to the National Trust and the competitors for the Ten Board Challenge. Shockingly, this is just one of over 3,000 separate, significant sewage pollution incidents that SAS have warned surfers and beach users about since the launch of the Sewage Alert Service. After years of campaigning for access to real-time sewage discharge information and the subsequent development of the Sewage Alert Service, SAS is pleased that we can track these incidents and alert the public with vital, common sense, health & safety information. Sewage pollution can pose serious health threats to those exposed to it, from the relatively minor ear, eye and throat infections through to gatroenteritis and even hepatitis. This is why real-time water quality information is so important to protect the public. The Sewage Alert Service also helps SAS track and catalogue these sewage pollution incidents, allowing us to build the case to ensure sewage discharges from sewer overflows are drastically reduced in the bathing season and throughout the year. Of course, simply warning people is not a solution to cleaning up problem sewer overflows and water catchments that adversely impact popular surf spots and designated bathing waters. However, the data SAS is compiling through the Sewage Alert Service will ultimately help in our call for the investments in the right places to help safeguard water users and the environment. In 2012, SAS highlighted the decision of the European Courts of Justice ruling that Northumbrian Water and Thames Water were illegally discharging raw sewage via combined sewer overflows (CSOs). This ruling exposed the overuse of sewer overflows as a means to discharge untreated sewage onto UK beaches and into rivers. Thanks to data from its pioneering Sewage Alert Service, SAS are uniquely placed to identify further offending CSOs similarly breaching the Urban Waste Water Treatment Directive (91/271/EEC), and Godvrey remains one of the beaches SAS is most concerned about. Extending the bathing season to better represent the times of the year the public use the sea, with the period from Easter to the end of the October half term being our minimum recommendation. At a recent Department for Environment, Food & Rural Affairs (Defra) consultation over 90% of the respondents called for a longer season. Regular water quality testing only occurs during the bathing season and CSO discharges are better regulated during this period. Make real time combined sewer overflow warnings (i.e. The Sewage Alert Service) mandatory at all affected bathing waters. Currently, SAS has to invest a huge amount of campaigning and lobbying time just accessing this information. Review the bathing water quality sampling spots to ensure results accurately represent what the public can expect to experience across designated recreational bathing waters. We believe that currently there are too many sample spots that are sited in areas that are unrepresentative of water quality in general and can mask poor water quality at some locations. Surfers Against Sewage also recently teamed up with the European Centre for the Environment & Human Health (Exeter University Medical School) to produce a study to help identify the health risks associated with exposure to marine pollution. The survey will help to assess the accuracy of current water quality monitoring procedures. The current sampling strategy involves taking on average one water sample from each beach once a week during the bathing season, which typically runs from 15th May to 30th September each year. Yet water quality at a single beach can vary enormously throughout the day and at different points along the length of a beach. If you experienced any illness after using the water at Godrevy over the weekend, please fill in our medical response form today. There could also be serious economic impacts associated with these incidents – cancelled surf lessons, cafes with reduced takings and B&Bs with cancelled reservations amongst many other things. Last year, Surfers Against Sewage issued an economic report on the value of surfing to the UK economy, which estimated an overall contribution of £1.8 billion annually. This further demonstrated the case as to why it is so important to drastically reduce the frequency of sewer overflow discharges at our beautiful beaches and surf spots, not just in Cornwall, but nationwide. Making sure your SAS membership is up to date to help support the core campaign work targeting water companies. Making sure that you follow the Think Before You Flush campaign to help protect the UK’s over-burdened sewerage infrastructure. Lobbying your local MP to join SAS’s All Party Parliamentary Group. Email [email protected] to get involved. Texting “SEAS25 £5” to 70070 to donate to Surfers Against Sewage and support our Safer Seas Service.